The two protected macaques being transported to the Piasau Nature Reserve temporarily. 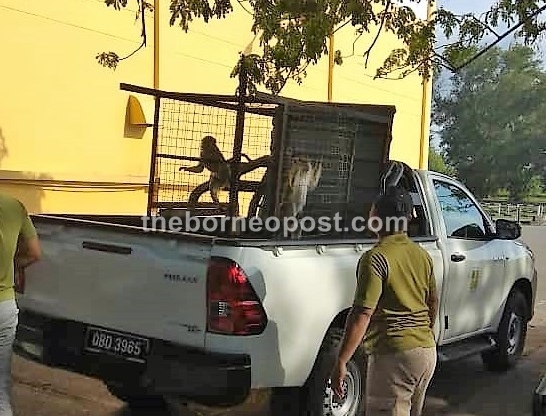 MIRI: Two protected macaques that were caged illegally in a house at Taman Tunku here have been rescued at last by the Sarawak Forestry Corporation and Sarawak Forestry Department. Personnel from the two regulatory bodies went about confiscating the animals after the issue went viral on social media today. Earlier, they had made several excuses for not taking action on the matter until the authorities here, including elected representatives, became involved. Among those who voiced their concern were Piasau assemblyman Datuk Sebastian Ting and Honorary Forest Ranger and chairman of the Malaysian Nature Society, MNS Miri Chapter, Musa Musbah. Miri Forestry Department head Anthony Banyan admitted telling media personnel yesterday that they didn’t have the proper facilities to keep wildlife that was confiscated, and also lacked the manpower to do so, especially with Chinese New Year on the horizon. “It is correct that I told the reporter accompanying my staff that we currently don’t have transport and a proper place to keep these two protected macaques,” he told The Borneo Post. “We also need a few days to prepare documentation for these protected animals. “We have a few options on where to relocate them; to Kuching in Semenggoh Wildlife Centre or in Matang, while the nearest location is in Lambir. Whether it is suitable here or not we have to wait for instructions from our specialist in Kuching where to finally send the monkeys,” he concluded. Meanwhile, when contacted, Ting said the two monkeys were being kept temporarily at the Piasau Nature Reserve while waiting for further instructions. “The SFC official informed me that the monkeys will be kept at PNR temporarily while waiting for the final decision from the experts,” said Ting, adding that he was happy that the issue had been finally resolved.